Since ancient times, black sesame seeds have been a key ingredient of vegetarian recipes and other dishes as a valuable source of nutrition. 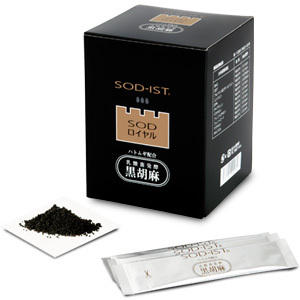 SOD Royal is a supplement produced by fermenting black sesame seeds with lactic acid bacteria, heat-treating them using a special technique to allow smooth digestion and absorption of sesame lignans (ingredients specific to sesame: sesamin, sesamolin, sesamol, etc. ), and then blending them with adlay. One sachet of SOD Royal a day means to ingest approximately 30 mg of sesamin.